Fast acting and long lasting relief1, to ease the irritation and inflammation of a sore throat. 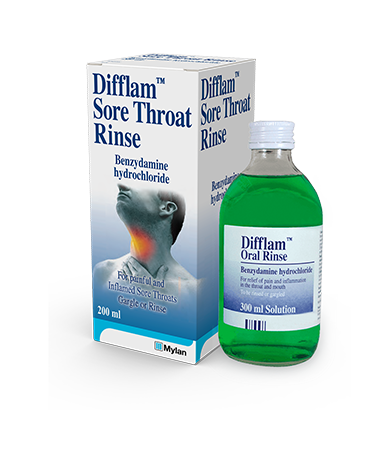 Mint flavoured Difflam™ Sore Throat Rinse can be used as a mouthwash or gargle by adults and children over 12 years old. It comes in a 200ml bottle with a handy measuring cup to help you dispense just the right amount. To treat the pain, soreness, swelling and discomfort of the throat, including pharyngitis. Pour 15ml of Difflam™ Sore Throat Rinse into the measuring cup. Gargle or rinse around the mouth for 20-30 seconds, then spit out. If you find Difflam™ Sore Throat Rinse stings the inside of your mouth, it can be diluted in the measuring cup with water. 15ml every 1.5 to 3 hours. Do not use Difflam™ Rinse if you are allergic to Benzydamine Hydrochloride or any of the other ingredients listed in the Patient Information Leaflet. Always use Difflam™ Rinse exactly as instructed, and check with a healthcare professional if you are not sure. If your symptoms get worse or do not improve, contact your doctor, pharmacist or dentist.